Modular kitchen concept is the latest trend of kitchen design that makes it beautiful and more functional. It offers you ample amount of storage ideas and style to your cooking space even within a restricted space. They have ready made cabinets or ‘modules’ available in a fixed price range which can be easily assembled to create a fully functional working space. Before modular kitchens arrived in furniture market, building a kitchen from scratch could burn a hole in the pocket and the budget for making the kitchen furniture was not certain in case of traditional carpenter-made furniture. They are available in a fixed price range due to which the cost of Modular kitchen is determined before even making it. The size and layout of the kitchen (U, L, straight, parallel, with island) is directly proportional to the price of modular kitchen. The reason is quite obvious and clear. Large kitchens require more number of modules, so clearly the cost will rise up, whereas in small kitchens it is reverse, less modules are required and eventually the cost will drop down. It is also determined by the usability of your kitchen space. Example, a frequent traveler, who doesn’t cook frequently and regularly won’t require large number of modules in the kitchen hence opting for only basic necessary modules even though there is vast amount of space to use. A full-time cook would perfectly make maximum use of modules and space in regular-sized kitchen. Modular kitchens come in wide range of materials and finishes and their selection plays an important role in determining the cost of modular furniture. Considering cabinetry finishes, there are different finishes to choose from having various costs, including laminate, acrylic, glass, membrane, etc. Acrylic finish and laminate finish are most favorite among the customers from the above list. Acrylic is resistant to scratches and gives a glossy look but is the most expensive. It is usually found in high-end kitchens. Laminate finish is budget-friendly. There is Hi-gloss finish and matt finish. Hi-Gloss finish is rather expensive than matt ones and tends to be taken more care as they are not more scratch-resistant. The matt ones gives a sophisticated and sober look to the kitchen interior. Also, keep in mind various factors such as heat, humidity and moisture while selecting material for your kitchen cabinets. The main function in the kitchen mainly depends on the kitchen appliances without which the kitchen fails or quite impossible to work or carry out cooking functions in the kitchen. They contribute to the main role in kitchen. They are available of various brands and a broad price range leading to wide range of choices. Invest wisely in the range of appliances according to your needs so your modular kitchen price perfectly fits your budget as well as fulfills your functional needs. Counter top is one of the most important parts of the modular kitchen and contributes to a huge cost among st the kitchen materials. Counter tops should be selected wisely keeping in mind the durability and strength of the material as well as its looks which can enhance the decor value of the kitchen interiors. Quartz, corian and polished granites have natural, high-end finish hence making them favourites for selecting countertop materials. Granite is available at an economical rate and easily available in various different textures whereas Quartz is the most expensive among various counter-top materials. Also Read: Select the Perfect Kitchen Countertops for your Home! The same goes for back splash. 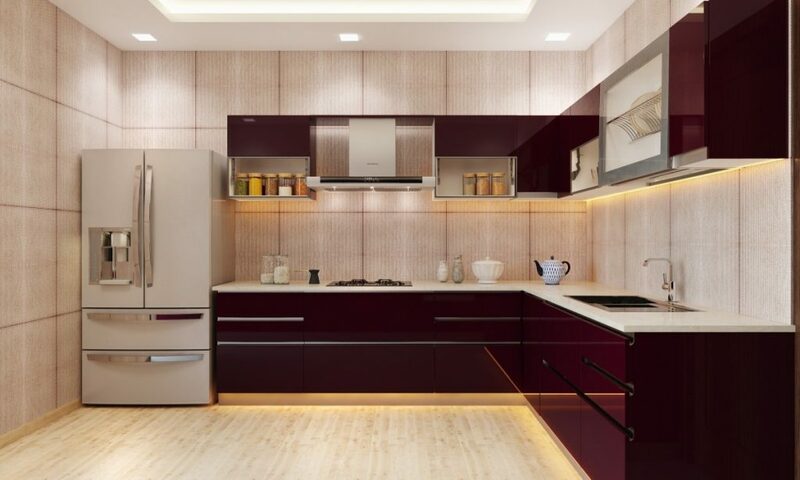 To create a focal point of kitchen area, users are opting for eye-catching materials like glass, metals or even stone for back splashing of kitchen wall. Ceramic tiles are the most famous in the market used for back-splashing of kitchen walls right now because of its economical rate and variety of designs. Every kitchen needs the correct accessories to have the capacity to work appropriately and it should complement with the kitchen design, and selected kitchen accessories will surely affect the cost of modular kitchen. So at the time of planning, think about what accessories are essential in your kitchen. It will be a waste of money if they are not used regularly. Next PostNext All the Basic Guide for Scaffolding!